I bought some roasted plaintain chips at Whole Foods on a whim last week for Nolan. He loves snacking on crunchy things, and I am always trying to find viable alternatives for potato chips. The plantains seemed very promising because they are not only crunchy, but visually approximate color and shape of potatoes. My hunch was a good one: Nolan scarfed down the little bag of chips in under a day, and I immediately started wondering if I could make them at home more cheaply and without the use of palm olein, which is a highly processed, fractionated version of palm oil. I had some black-spotted yellow plantains already sitting in my kitchen window waiting for a project, so I pulled one out while making dinner last night and set about a little experiment to determine the most effective method for making plantain chips. I started out by peeling and slicing my plantain, using a mandoline set to 3/16″ for uniform slices on the diagonal. The batch at the top of the photo was made by frying slices in my cast iron skillet, using coconut oil and medium heat. The chips tended to brown a lot, especially around the edges, before they got to the point of being crispy, and many still had a soft spot in the center despite the dark coloring. However, they were absolutely delicious warm from the oil–we all liked their subtle sweetness, including the baby, who gnawed on several chips while I made dinner (paleo coconut shrimp, cooked in the same oil). The next experiment was roasting the plantain slices, like the Whole Foods original. I laid some out on a silpat with no oil at all, and put them in a 400F oven alongside some beef marrow bones that I wanted to roast for the baby’s dinner. I set the timer for 20 minutes for the bones, intending to check the plantains every 5 minutes or so until they looked close to done. Then I forgot about them until there were only 2 minutes left on the timer (whoops!). They were a little bit overdone, not quite burned but browning, so I would probably pull them after 12-15 minutes next time. (The marrow bones were just right, however; this was Theo’s first taste of marrow, and he ate about a tablespoon willingly, then he started shuddering and rubbing his face as a sign of displeasure. Next time I’ll try soaking the bones in a few changes of water before roasting to see if that improves the flavor, as I’m told marrow can be bitter or metallic from residual blood.) Roasting created nice flat plantain chips that browned uniformly and had an excellent crunch, so this would probably be a more easily controllable method than frying; these are shown on the left in the photo. 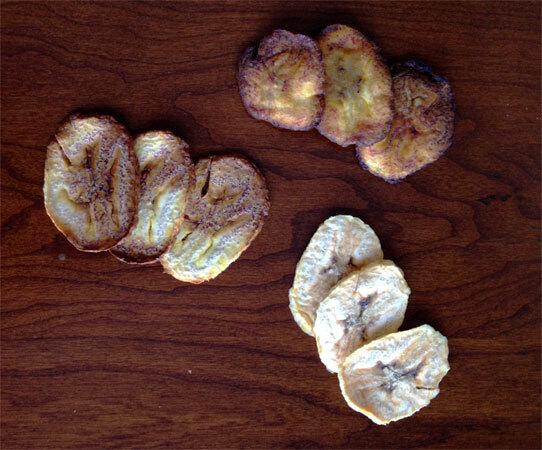 Essentially, all three of these methods for making plantain chips were successful, and which one you choose will depend on your level of patience and commitment. The fried plantain chips were ready the fastest, but they were also the messiest and most prone to burning and uneven cooking. I would probably be more likely to stick with tostones if I am going to fry, but sliced a bit thicker and then dusted with cinnamon sugar, these would make a great quick dessert. The oven method is ideal for people who don’t have a dehydrator, but again, be sure to watch them closely to avoid burning. The dehydrator, of course, won’t burn your plantains and gives a nice consistent result, but it does require more time, so if you have a child hovering around the kitchen looking for his snacks, stick with the oven. I would say that the most difficult part of this entire process is just finding plantains! They are sometimes stocked with the bananas in your grocery produce section, and sometimes with the exotic or tropical fruits, but in my experience around here, regular grocery stores do not carry them reliably. Black or black-spotted yellow plantains have a higher sugar content and a banana-like flavor, although they are still starchier than bananas. Green plantains are so starchy that they are extremely hard to peel, but are perfect for tostones or other applications that require that high starch content; they can also be pureed for use in paleo tortillas or flatbreads. 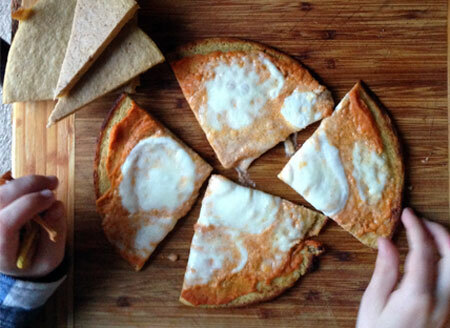 The latter is delicious warm with chocolate hazelnut butter or rebaked with toppings as a pizza crust. Did you coat them with oil before you dehydrated them?